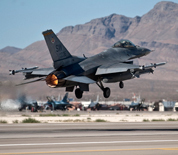 Nellis AFB is located approximately 12 miles east of Las Vegas, Nevada. It is a major location for training and has more schools and squadrons than any other USAF base. Training operations, such as Red Flag, are often conducted together with Army, Navy and Marine Corps units. The 57th Wing serves as the host unit on base. Additional units include the Nevada Test and Training Range, 53rd Test and Evaluation Group and the Thunderbirds flight demonstration team. The nearby Tonopah Test Range and the Nevada National Security Site fall under the jurisdiction of Nellis. This Nellis AFB directory features the critical info you’ll need to navigate through the many facilities and recreational opportunities available on base.